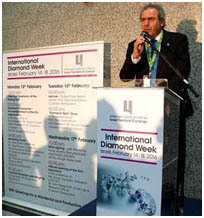 Recently, Nobel Prize winner Professor Dan Shechtman officially opened the Diamond Technology Zone during a short ceremony held in the Israel Yoram Dvash Diamond Exchange, during the International Diamond Week in Israel (IDWI) at the conclusion of the third trading of the week. Israel Diamond Exchange President Yoram Dvash opened the proceedings saying, "There is nothing more significant than seeing this diamond technology zone. This is the most advanced and up-to-date technology in the diamond industry, and they are all right here in the Israel Diamond Exchange. Some of these companies come from technology, but most of them are diamond companies," he explained. "I have seen the diamonds and now I wish to see the technology behind them," Shechtman told the audience, adding that he understands a little about diamonds having studied them as part of his chemistry profession. "In Israel, we do not have so many industries that possess such a glorious standing as the Israeli diamond industry," enthused Shechtman. Professor Shechtman visited each of the companies participating in the technology fair, taking the opportunity to learn about each of their specialty. Israel is known to be a leader in the diamond technology sector, having placed a special focus on using technology to making the diamond industry more productive, efficient and interconnected. A variety of technological offerings from cameras and gemological tools to software systems were on display. 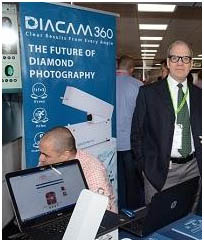 The Diacam 360 photography system was demonstrated at the IDWI tech zone by Shirtal Diamonds. The small, portable, effective and affordable camera creates high-quality photos and Chaim Volner 360-degree, interactive videos of polished diamonds and rough diamonds. Founder and owner of Shirtal, Haim Volner, explained that his more than three decades of experience in the diamond industry led him to understand that the technology sector is the future. "People have understood that the world is moving towards electronic and internet commerce and a less personal type of trade. Potential clients are based all over the world and internet marketing is relatively cheap. The more easily one can pass information on to your clients, the more easily one can make sales," explains Volner. 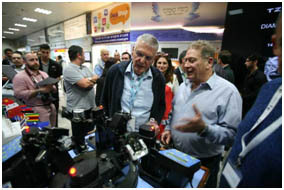 Tweezar unveiled a diamond photography system at the IDWI techzone that saves both time and money. With the click of a button, one receives a quality diamond image, both on a cellphone and on the cloud, from where it can be sent to clients immediately. Tweezar owner Carlo Rubinshtein explained, "Most of the diamond dealers' business activities are moving online and visual images of diamonds are an essential part of business. We examined the technology available on the market and we saw no easy and cheap way to photograph diamonds in a controlled manner." "We chose the International Diamond Week in Israel to unveil our new device. Israeli diamond dealers are our target audience and it was appropriate for us to launch here with special prices," concluded Rubinshtein. Dialit launched its new automatic diamond polisher at the IDWI. The machine reaches polishing levels of triple X and features automatic angling. Dialit Managing Director Amram Leshed says, Prof. Shechtman at the Dialit booth "Our machine has the final say in automatic diamond polishing. The machine features a High Definition (HD) camera and allows for top-quality diamond polishing, even when operated by an inexperienced person. Dialit sells its polishing machines all over the world, including Russia, China, Africa and India, and the company has an outstanding reputation when it comes to polishing machines. "The International Diamond Week in Israel is the perfect opportunity for us to display our new machine, which was developed and manufactured entirely in Israel. We are very proud of our cooperation with the Israeli Diamond Industry," concluded Eshed. 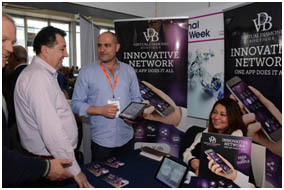 Virtual Diamond Boutique (VDB) was a first time exhibitor at IDWI. 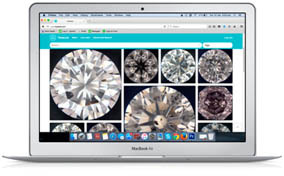 The company offers a virtual search platform for listing and buying diamonds, using video and HD photography as an integral part of the platform. The United States based company's platform is relatively new, and currently free to use, offering some 80,000 diamonds. Over a quarter of these diamonds, which are sourced from over 40 New York based vendors, have been photographed. "We regard the VDB platform as the Instagram of the diamond world. The visual aspect of the software, which runs on both Android and IOS operating systems, is very important," explained VDB Chief Operating Officer Gil Ohad. Ohad explained why the company chose to participate in IDWI: "Our target market is here in the Israeli diamond industry," said Ohad. 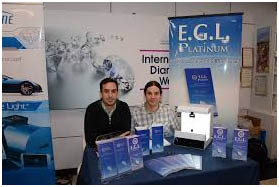 Meanwhile, EGL offered its Dazur lighting system for helping diamond dealers check a diamond's color. The system, which makes it possible to distinguish a diamond's color more accurately, is suitable for gemological laboratories and for large diamond companies. The global company has undergone a number of changes in recent months and offers a good consistent system of oversight under the guidance of its global brand manager Menahem Sevdermisch.